President Hugo Chavez told his military to be prepared for a possible confrontation with Colombia, warning that Bogota's plans to increase the U.S. military presence at its bases poses a threat to Venezuela. Chavez has issued near daily warnings that Washington could use bases in Colombia to destabilize the region since learning of negotiations to lease seven Colombian military bases to the United States. "The threat against us is growing," Chavez said Sunday. "I call on the people and the armed forces, let's go, ready for combat!" The former paratroop commander said Colombian soldiers were recently spotted crossing the porous 1,400-mile border that separates the two countries and suggested that Colombia may have been trying to provoke Venezuela's military. "They crossed the Orinoco River in a boat and entered Venezuelan territory," Chavez said. "When our troops arrived, they'd already left." In Bogota, Colombia's foreign ministry issued a news release denying reports that soldiers crossed into Venezuela, after a revision of troop movements by the Colombian military. Chavez said Venezuela's foreign ministry would file a formal complaint and warned Colombia that "Venezuela's military will respond if there's an attack against Venezuela." Chavez said he would attend this week's summit of the Union of South American Nations in Quito, Ecuador, to urge his Latin American allies to pressure Colombian President Alvaro Uribe to reconsider plans to increase the U.S. military presence. 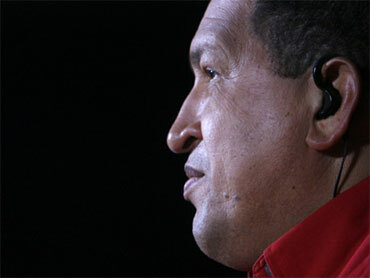 "We cannot ignore this threat," Chavez said during his weekly radio and television program, "Hello President." Chavez also halted shipments of subsidized fuel to Colombia, saying Venezuela should not be sending cheap gasoline to an antagonistic neighbor. "Let them buy it at the real price. How are we going to favor Uribe's government in this manner?" he said. Colombian officials say Venezuela has no reason to be concerned, and that the U.S. forces would help fight drug trafficking. The proposed 10-year agreement, they claim, would not push the number of American troops and civilian military contractors beyond 1,400 - the maximum currently permitted by U.S. law. Tensions between the neighboring South American nations also have been heightened over Colombia's disclosure that three Swedish-made anti-tank weapons found at a rebel camp last year had been purchased by Venezuela's military. Chavez has accused Colombia of acting irresponsibly in its accusation that the anti-tank rocket launchers sold to Venezuela in 1988 were obtained by the Revolutionary Armed Forces of Colombia, or FARC. Sweden confirmed the weapons were originally sold to Venezuela's military. Chavez denies aiding the FARC. He claims the United States is using Colombia as part of a broader plan to portray him as a supporter of terrorist groups to provide justification for U.S. military intervention in Venezuela. Chavez said Sunday that diplomatic relations with Uribe's government "remain frozen" even though he ordered Venezuela's ambassador to return to Colombia more than a week after he was recalled.